After more than 5 years in this house, we still have no photos on the walls. I think it’s a combination of laziness and not knowing what we want. We do have a few picture frames standing here and there and we’ve recently hung up a few paintings. But we still miss a nice picture on the wall. We’ve talked about a photo on canvas, but we had not yet decided which photo. During our summer holidays, we took a really cute picture of the boys and I wanted to do something with it. Once you know, which picture you want to use, you have to go find a provider. There are loads of providers out there. 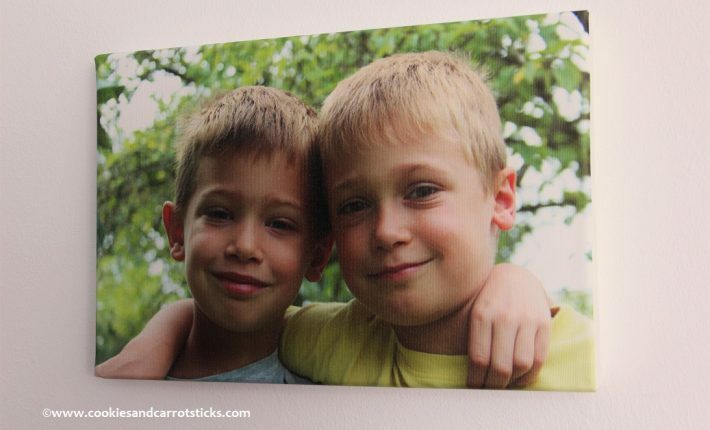 Almost everywhere, where you can print your digital photos, you can order wall decorations. How can you possibly decide which provider to use? And then, just at the right time, I receive an email from Fotofabriek.nl, asking whether I would be interested to test a photo on canvas for them. Well, I did not have to think twice to answer that question! I could choose between a canvas of 20×30 or 30×20 cm and as I already had decided which picture I wanted to use, the whole process was done in a flash. If you are a first-time visitor, you have to create an account to be able to upload and edit pictures. Then you can choose from a variety of products, like photo books, planners, calendars and more. Under wall decoration, you also find quite a variety of different products and I obviously chose photo on canvas. After choosing the size, you can start designing. You can choose to print one photo, but you can also choose to make a collage of 2, 3 or 4 photos. Choose the layout, to determine whether the sides are printed or not. If you don’t want to use a frame afterwards, you probably want the sides printed. Once you’ve uploaded your photo(s), you can see in the preview whether the sides are printed or not. After uploading, you can still change the layout and the number of pictures. In addition, you can also add text or clip-art. I left the picture just as it was, but I did choose unprinted sides as the faces would not have fit as well as I wanted. Once you’re done, you can click the order button. When you hit the order button, you will first get an overview of your project and you can choose to have a digital preview sent to your inbox (so you can see how the picture looks on your wall). Before you actually placed the order, you can choose to have it printed in standard quality or premium (at a surcharge). 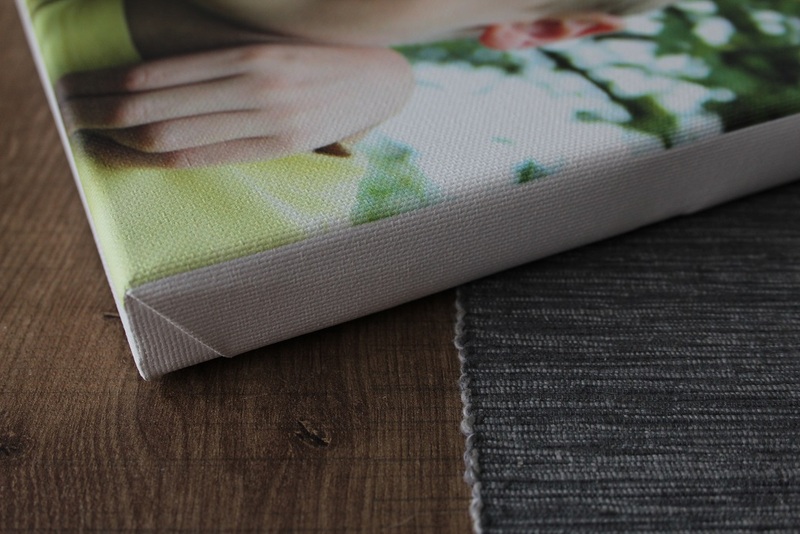 If you order the photo as a present, you can have it gift wrapped. In case of a present, you can have it sent to a different address (by adding extra delivery addresses in your account). As a last step, you go through the payment process. I placed my order on Wednesday evening and I received a notification the next morning, that my order was in production. By the end of the day, I already received confirmation that the order had been shipped and just moments later I got an email with a link to the tracking site. On Friday morning, I checked the status of the shipment. Now it is a trans-border shipment, as I live in Belgium and it’s shipped from the Netherlands. That does sometimes cause a delay in delivery. However, the shipment was due to be delivered on that same day. At exactly 11.30h, the carrier rang the bell. That’s less than 48 hours after I had placed my order. Of course, I don’t know how long other products might take, such as whole photo book, but this was just superb. Super-fast service. I wasn’t in a hurry and I would not have thought of it as strange if it had taken a couple of days. If something has to be made to order, it is rather normal if it takes one or two days extra. But if you are looking for a last-minute present, this is just perfect. Especially now, with the upcoming holidays. So, if you are looking for a nice, personal present for Christmas, a birthday or any other occasion, you should definitely check out Fotofabriek.nl. The result is just beautiful. The picture I used wasn’t of the best quality, but I did choose it nonetheless as I like it so very much. Even though the digital picture lacked quality, the print on canvas turned out really well. As mentioned before, I did choose unprinted sides in the layout, as the faces would not have fit the frame very well (the picture has been cropped). It doesn’t bother me at all and I can still choose to put a frame around it. But if you absolutely don’t want to use a frame, be sure to use the correct layout, with the sides printed. I did notice though, that the sides were not evenly printed. My first thought was that they had not put the canvas on correctly. But then I looked at the photo again and saw that the faces were nicely centered. The canvas is decently wrapped for shipment. 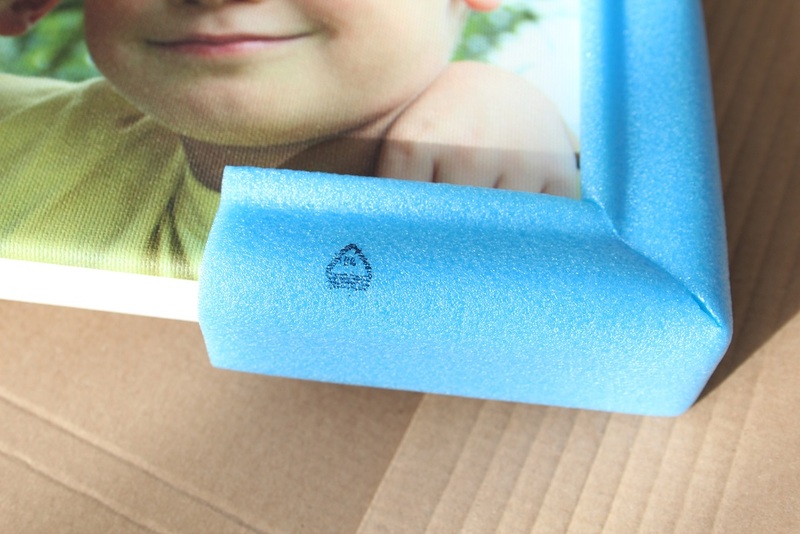 The corners are protected by foam, which also prevents the packaging from touching the canvas. All in all, I am very satisfied with the result and the whole process of ordering. 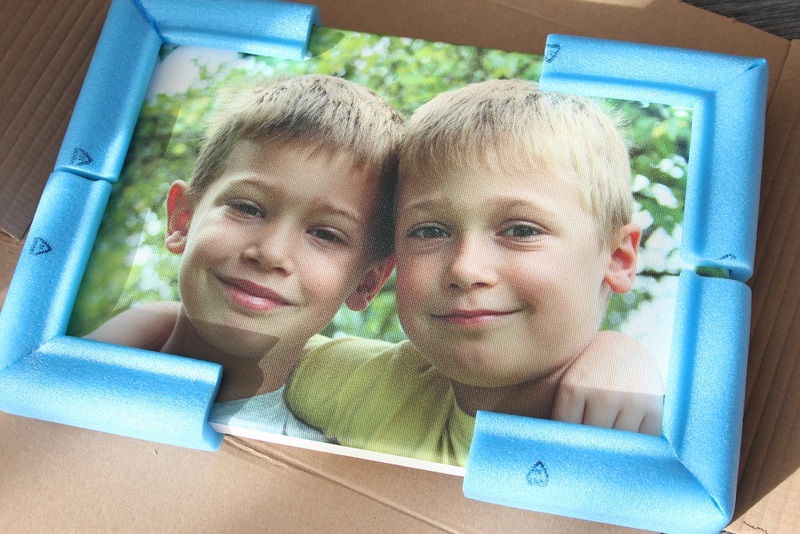 Have you ever had a picture printed on canvas or ordered any other photo products online? This post is in collaboration with Fotofabriek.nl. Everything I have stated above is based on my own opinion and personal experience. Wat een mooie canvas! Hier moeten we ook nodig nog wat meer foto’s aan de wand hangen..
Luiheid… hmm herkenbaar hoor. Wat een schattige mannetjes en een mooie foto!